This method - a cornstarch-salt rub and cooking well-chilled meat - worked perfectly, producing deeply browned steaks that were still medium-rare. And of course the chimichurri sauce added a huge flavour punch. Nicely balanced dry rub - not too spicy, not too sweet - that allowed the flavour of the meat to shine. Cooking instructions worked perfectly for a stove top grill pan. This will now be my go-to way of cooking pork chops. Nice little pan sauce, too. Method involves placing chops in low 275 degree oven until they reach 120-25. Then searing a minute or two per side. All my guests said this was the best turkey they had ever had. The roasting process once it was butterflied and the salt rubbed into and under the skin was a snap with no basting to worry about. Also because it roasted at such a low temperature there was no worry about it quickly overcooking. I had brined the 15.5 lb turkey first using Martha Stewart's brine recipe that calls for water, kosher salt, a bottle of riesling, and whole spices including juniper berries, mustard seeds, pepper corns and bay leaves. Because my turkey was brined in advance I think I will cut the salt rubbed on the turkey by half next time. It was a bit saltier than our normal taste but not excessive. I also made the cranberry molasses glaze which gave the turkey skin a lovely glistening brown shine and a lovely flavor. As suggested I heated the extra glaze saved back and served it at the table to pour onto the turkey slices as desired. Very tasty. The lemon zest and tomato paste perked up the flavour of what was otherwise a basic marinade. I browned the kebabs stove top in a grill pan and finished them in the oven, not one of the recommended cooking methods, but I'll make this again when it's warm enough to fire up the outdoor grill. The marinade did a great job of enhancing the natural flavour of the beef. Another excellent marinade for beef steaks. Used on T-bone with recipe cut in quarter. Love the addition of soy sauce to this mojo marinade unlike many other recipes without it. The marinade, cooking method and sauce worked beautifully with boneless turkey breast, requiring just a slightly longer cook time before the final sear. I don't have the 11" straight-sided pan called for in this recipe; it's an odd size. A 10" pan allows insufficient room for the chicken, but a 12" pan would make the oil too shallow. I suggest either using less chicken and a 10" pan (in which case you could reduce the amount of coating and slightly reduce the oil) or use a 12" pan and a little more oil. Not having anticipated how important this was, I ended up frying the chicken in two batches in a smaller pan. It was still fine, but there was a lot of opening and closing of the oven, trying to determine which chicken pieces were done, since they hadn't all gone into the oven at the same time. These are excellent. If using a food processor instead of a stand mixer, pureeing the pork mixture should be a bit faster than the recipe states. Pre-crumble the beef, scatter it over the top, and pulse to mix it in. Great new way to do mid-week pork chops that gives them lots of flavor and keeps them very moist. My husband who is picky about dry pork loved these. I took a bit of a short-cut on the breadcrumb coating for the outside but otherwise followed the recipe to a T. Instead of making crumbs from scratch in the food processor and oven, I sauteed the shallot and garlic in the oil in a large frying pan on medium heat. Then I added panko crumbs to the pan equal to the amount of breadcrumbs called for and stirred them until they turned golden brown. The finished result was perfect! The crumb coating was crunchy, the seasoning was perfect and the chops were done just right and as I mentioned before, very moist and flavorful. Excellent recipe that as the previous reviewer noted produces moist and flavourful chops. The method makes them a bit time consuming for a quick weeknight meal but with the breadcrumbs made in advance (they keep for a few days) it would be quite doable. I may even try baking the breaded chops from frozen as suggested. Note that there were enough of the egg and breadcrumb mixtures to coat 6 chops. This worked perfectly even with larger, bone-in chops. The breading was thicker than the typical flour-egg-breadcrumb but adhered really well to the meat and remained crisp (even with a chop that was reheated in the microwave!) The rub added an extra layer of flavour. This is my favorite pumpkin pie ever. The bottom crust was crisp, the custard silky and perfectly seasoned, and the fresh ginger gave it a fresh flavor boost. I got lots of compliments at our Thanksgiving dinner and this will be my go to pumpkin pie from here on out. I ended up roasting a red skinned sweet potato for 40 minutes at 350F until soft and adding a cup of the cooled mashed sweet potato in the recipe. It did add a richness that you do not get from just the canned pumpkin puree. This is the best cheesecake I have ever made. I have made it twice and both times my guests and family raved about it. The texture is light and creamy and not overwhelmingly sweet or rich. The tart lemon curd layer on top is essential to giving a real lemon zing. This cheesecake just gets better every time I make it. For the 4th of July barbecue I made the cheesecake the day before and then just before the guests arrived for the barbecue I mixed about 1 cup each of blueberries, raspberries and cut-up strawberries in a bowl with 1/4 cup sugar and 1-2 tablespoons of Clear Creek Blackberry Liqueur. I covered the berry mixture and let it sit in the refrigerator until time for dessert. The results were fabulous! Not only did the berries make the cheesecake slices look very festive and colorful but the flavor combination of the lemony cheesecake and lush berries was heavenly. A very involved recipe, but one sure to please. Just making the crust takes a full day - the most ingenious part is brushing it with egg white after cooking (to for a barrier to the liquid filling, keeping the crust crunchy). A lot of bacon, spiced perfectly (nutmeg and cayenne), and Gruyere cheese made this a big hit with the teenager. I was worried that the custard might spill over into my new oven, so I put ~ 1/2C in each of two custard dishes. These were done more quickly, and also delicious on their own, with neither crust nor bacon. Great flavor but the 325 F oven temperature called for did not produce the nice brown outer crust even with extra time in the oven. After looking at recipes from three other books it looks like the temperature should be 350F. The low temperature and low browning also made the cake stick in the pan which was a nonstick pan. This recipe is delicious! The sauce is great, as is the cauliflower cooking method. Have made it 2x now and it was a hit both times. This is gorgeous, but it's wasteful to discard the narrower parts of the sweet potato. Just take them out of the oven earlier than the large slices. Their thinness gives them a particularly wonderful ratio of caramelized outer edge to soft interior. Good recipe and very easy to execute. Following the instruction to cut the carrots in uniform size ensured the carrots cooked evenly. Only adjustment I will make is to reduce the amount of butter - it was slightly too much for the amount of carrots I used (my bunch was under 1 lb). Otherwise, would recommend. The flavours were very good but the vegetables browned very quickly in my oven, before they were cooked through. Next time, I'll keep them under foil for an extra 10 minutes. I used olive oil instead of butter. Method worked perfectly so sprouts were caramelized and cooked through without tasting cabbage-y but the high oven temperature was not kind to loose leaves. Next time I make them, I'll add those loose leaves to the pan towards the end of the roasting time or I'll try one of the toppings and add them to the saute pan. I used beans I had cooked and frozen with just a little of the pot liquor so I skipped the step that was supposed to add to the depth of flavour (brining the beans then cooking them with some sofrito). Even so, using chicken broth to make up the balance of liquid, this was still a wonderfully flavourful dish. I do look forward to making it using the proper method. Simple. Delicious. Perfect accompaniment for crab cakes. Delicious! They were moist and almost cake-like and bursting with blueberries but next time I'll omit swirling the "jam" into the batter (since most of it just sat on the top) and just hide a spoon of it inside the muffin for a nice surprise. I've often been witness to my melted butter clumping when added too warm to milk that was much cooler (much to my chagrin) but it's this very clumping that apparently makes this recipe work! These were a breeze to put together and family loved both flavour and texture. The muddle + marinate technique works nicely! We only had peaches, but I imagine the strawberry/blackberry combo would be delish. ...you could hardly do better if you’re looking for consistent results and abundant flavor in recipes you may already know. And answers to that eternal culinary question: why? It is fun to read through, even if you don’t end up making the recipes that are paired with each concept (although, since their CI recipes, you know that they will be reliably delicious). Great cooks seem to operate on intuition. Watch one at work and you might think he or she must have a sixth sense that switches on in the kitchen. But great cooks aren't psychic. They simply understand the fundamental principles of cooking, the unspoken rules that guide their every move in the kitchen. What's behind these principles? Science. At America's Test Kitchen, we know something about that. The team at Cook's Illustrated has spent the past 20 years investigating every facet and every detail associated with home cooking through tens of thousands of kitchen tests. In The Science of Good Cooking, we distill the past two decades of this test kitchen work into 50 basic cooking concepts, ones that every home cook should know. These concepts sound suspiciously simple: Gentle Heat Retains Moisture. Salty Marinades Work Best. Starch Helps Cheese Melt Nicely. Sugar Changes Sweetness and Texture. It turns out that these ideas are not only easy to understand but also easy to master. And don't worry, there is no molecular gastronomy, liquid nitrogen, or fancy equipment involved. As always, our mission is squarely focused on great home cooking. In addition to explaining how food science works (and why you should care), The Science of Good Cooking shows you the science. This book brings you into the test kitchen with 50 unique (and fun) experiments engineered to illustrate (and illuminate) the science at work. The experiments demonstrate why adding fat to your eggs will make the perfect tender omelet, why grinding your own meat will make the ultimate burger, and why you should have patience before carving your roast. 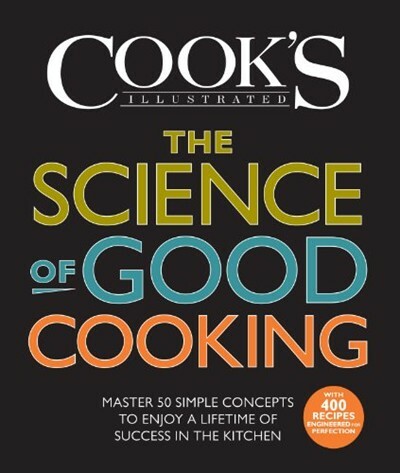 And because no concept is complete without recipes, The Science of Good Cooking includes more than 400 classic Cook's Illustrated recipes that take the science to the stove, putting the principles to work. The book offers a fresh perspective on everything from roasting a chicken to baking chocolate chip cookies. These are the fundamental recipes home cooks struggle to get right. And when these recipes are coupled with the simple science explaining how and why they work, the results are illuminating.